What do Rod Stewart and Robbie Williams have in common? They both use Hainsworth cloth! The company traces its history back to 1783 when Abimelech Hainsworth, ‘Old Bim’, started his clothiers business. This was before the time of power looms so cloth would be woven on hand looms by weavers in their cottages and collected by Abimelech and transported by cart to the Leeds Coloured Cloth Hall. Slowly his business grew and by his death in 1836 he was the wealthiest man in the district with a personal estate of £12,000 (which would equate to just under £600,000 in today’s money) and two thirds of Cape Mills in Farsley. The company passed through the family over a number of generations and they saw a number of changes including industrialisation, the purchase of a new mill (Temperance Mill) in 1882 which then expanded in 1889 to include Spring Valley next door. A new mill was built in the 1950s as a result of a fire in the original building. Illustrations for 'A Story of Excellence', highlighting the different cloth manufactured. Hainsworth has a long history of creating cloth for the military . Beginning with the bright scarlet cloth of the 19th century which then had to be adapted as warfare adapted to include Khaki Serge. However, the bright cloth is still used today for ceremonial dress. The company persevered through the great depression of the early 20th century and also survived a fire which destroyed three quarters of the mill in December 1955 and from this disaster they took the opportunity to rebuild and renew, moving away from traditional steam to electric power. From this point on the company went from strength the strength by a number of sound acquisitions which enabled them to introduce a wide range of new products. 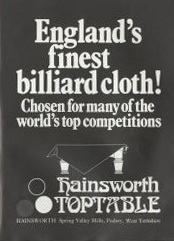 These included becoming specialists in the creation of snooker cloth, biscuit cloth for biscuit production conveyor belts and also piano baize. In 2008 to celebrate over 225 years in business they underwent a brand review and re-launched with a fresh new image and a firm grip on the ever changing textile industry. View the collection on our online catalogue, under additional finding numbers WYL2325 and ﻿WYL1402﻿, or visit their website for more information.